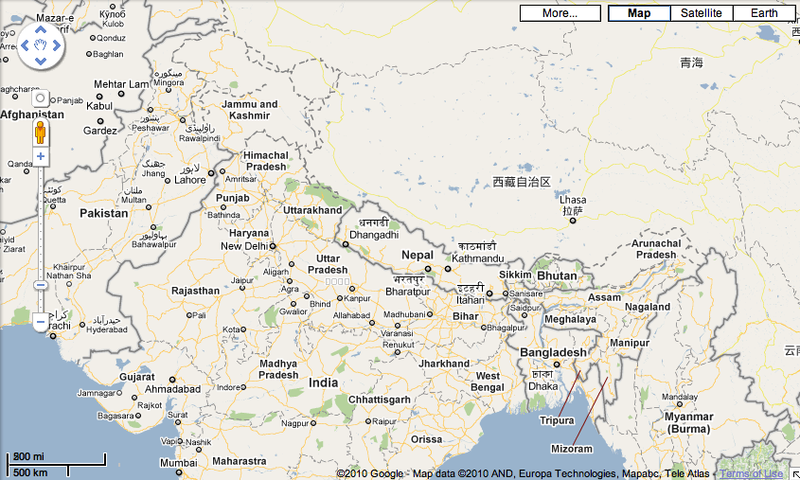 The case of multiple versions of Google Maps was covered by me a few days ago with regards to the depiction of Kashmir in the Indian sub-continent. What Google has been doing is showing different maps to different countries according to what the government and people there demand... regardless of ground realities. I had also mentioned how there was a political and media fuss a couple of years ago against Google in India for precisely this reason. Today, however, it seems the issue has come back (as reported in the media). Only this time its not Kashmir in focus, but rather Arunachal Pradesh (an eastern state of India claimed by China). Now isn't this just lovely! What could be better? Well... what the western world gets to see ofcourse! As you can see, the third map is the closest to ground realities barring of course Arunachal Pradesh (and some parts of Uttrakhand). There is really no reason to show that as a dotted boundary and leave other more 'internationally' disputed territories like Tibet totally inside China. The rules should be the same for everyone. 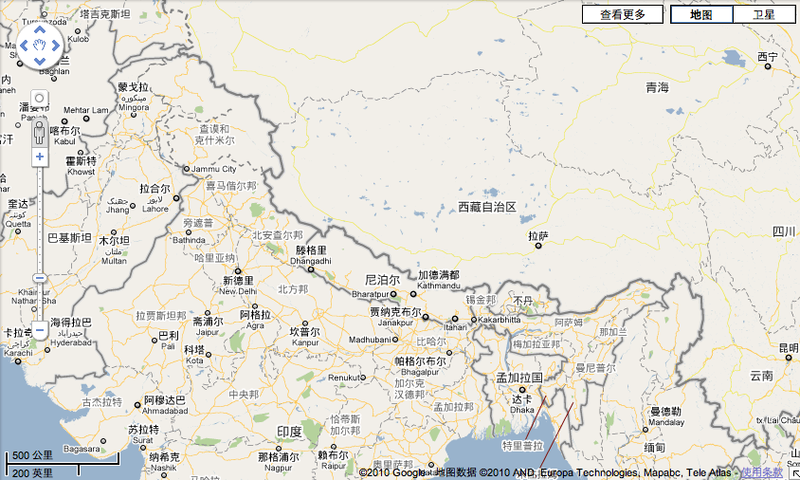 Like Tibet is under de-facto Chinese control so is Arunachal Pradesh under Indian. Infact... India didn't 'capture' Arunachal Pradesh by military action either. In the case of Aksai Chin, China did move faster to claim and subsequently incorporate it within its territory and all India could do was complain about it being a part of Ladakh. Like I said in the last related post, Google should just keep things levelled globally. Use the same version of maps everywhere! Depicting ground realities! Regardless of the fact that some of our parliamentarians might raise objections and regardless of how China might want to arm twist them... middle ground can be found (as demonstrated by the continued re-direction of Google.cn to Google's Hong Kong website). The point is that currently both Google Maps India and Google Maps China are completely inaccurate! Patriotically satisfying sure... but inaccurate. I'd rather see the dotted lines and disputed territories and be aware of them rather than be shown a sand boxed and unrealistic depiction that is just misleading. [Update] It seems the issue has gained traction in the main stream media. Here is a clip of an NDTV discussion of the issue with Sachin Pilot (Member of Parliament) on the course of action available to the Indian Government regarding all this. 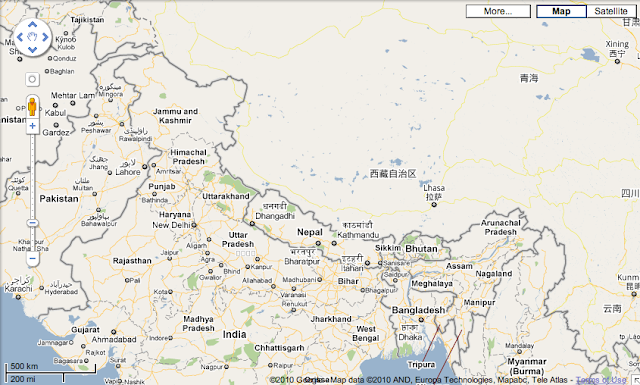 While I agree its sort-of deceitful, I don't think India can or should force Google to show the 'Indian version' of the map globally. I think a modified version of the Google.com map (Arunachal Pradesh & parts of Uttarakhand inside India) should be put up instead... leaving the disputed parts of Kashmir marked as disputed. That would be more accurate for students and others.